Ismail Kadare is an Albanian author who came to the world’s attention when he won the inaugural Man Booker International Prize in 2005. Since then he has also won the highly prestigious 2009 Principe de Asturias de las Letras in Spain as well and his novels have been translated around the world. I’ve read three of his books, The Accident and The Siege (and The Palace of Dreams before I started this blog) and I have four more on the TBR so you can count me as an enthusiast. I was delighted when his latest novel, The Fall of the Stone City was shortlisted for the Independent Foreign Fiction Prize. is bordered by Montenegro to the northwest, Kosovo (Disputed) to the northeast, Macedonia to the east and Greece to the south and southeast. It has a coast on the Adriatic Sea to the west, and on the Ionian Sea to the southwest. It is less than 72 km (45 mi) from Italy, across the Strait of Otranto which links the Adriatic Sea to the Ionian Sea. So when we read Kadare’s whimsical explanation for the city’s sense of itself, hedged with his trademark uncertainty, we get a clear sense of what it’s like to live in a country where neighbours can’t be trusted. When the story begins, it’s 1943, World War II is raging and Italy has just capitulated. Two doctors, Big Dr Gurameto (trained in Germany) and Little Dr Gurameto (trained in Italy) are emblems of this state of flux. Because four years earlier, the event that some people called the Italian invasion, and other Albania’s unification with Italy (p. 4) has suddenly left Albania in a vacuum. Which doctor is on the winning side, and who the loser? What will happen in this vacuum? What will Albania’s ally Germany do? Well, they arrive, with tanks etc, and all the paraphernalia of the Nazi Occupations everywhere else. Friends or foe? They drop pamphlets, promising the usual lies, and the city has the usual conflicted responses. Will they believe that the Germans come in peace? Or should they be resisted? Astonishingly, the commander of the German forces turns out to be an old university friend of Big Dr Gurameto, and all would (probably) be well, except that some militants open fire on the advancing Germans. Fritz von Scwabe promptly takes some hostages in reprisal, and there is a tense dinner party between the two old friends to negotiate the release of the hostages. (One of them is a Jew too). Time goes by, and the war ends, and the Communists fill the vacuum. Now totalitarianism is the foe, and the gossip that has always surrounded this strange dinner party comes to the attention of the authorities. Both the doctors are interrogated in a strange Kafkaesque scenario that also owes a debt to Gogol’s surreal fiction. Any Australian reading this novel from the safety of an island continent far away from everything, can’t help but feel intense compassion for the small countries of Europe and their travails in the 20th century when they were in no position to resist the awful isms of that period. 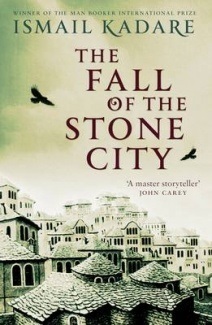 The Fall of the Stone City is another brilliant novel from an author whose voice is a constant reminder that we need to cherish and nurture the freedoms that we have. I read this book as a member of the Shadow Independent Foreign Fiction Prize Jury. To view other reviews of this and other nominations please click here or on the IFFP graphic. There are other reviews at The Complete Review, The Independent and The Guardian. I’ve only read The File on H, which I found absolutely brilliant. Your point about using allegory to make a political point is strikingly explored in that book, through the use of the Homeric myth, and how myths/poetry can be a source of political power and contestation. Thanks for this – I’ll put this next on my Kadare TBR list. *blush* No, I can’t resist it. I’ve ordered it from Fishpond! Nice to see you like his novels. He’s my favorite writer and I had the great opportunity to read his works in the original albanian since it is my mother tongue and there are like 20 volumes available in albanian. What other books by him are you planning to read ? If you liked The Accident then you’ll probably like The Successor since it’s the same kind of difficult-to-understand-investigation-novel. Hello, and wow, how lucky you are to be able to read the works of this genius in the original language! Yes, I’ve read a few reviews that were unenthusiastic about The Accident, but even though it was mystifying, I liked it, in the way that I like puzzles and mysteries and conundrums and cryptic crosswords. As I say in my review, (which is really more of a wander through some miscellaneous interpretations LOL) I don’t claim to fully understand it, but then, I don’t feel I have to. I know he’s alluding to aspects of Albanian history and culture that I don’t know about, and I can’t hope to know about the political, literary and social history of every country, so I just do the best I can and enjoy learning as I go along. Perhaps I understood it a little bit more than some people because I’ve read a little bit about surveillance and security services as stuff like that, notably Stasiland by Anna Funder, which did a lot to explain about the craziness of how these organisations worked. Genius ? Maybe. The way he uses language fascinates me . I don’t know how good the english translations are but he certainly loses some magic through translation , it’s like translating poetry , it loses the rhyme , even though that might be the case for every writer . Did you buy those books or did you get them at the library ? Which are you planning to read first? I’ve bought them all, my local library isn’t very strong on translated fiction. I’ve been lucky and picked up a couple of them on bargain tables, but the others I ordered from overseas. I don’t know what to read first, it will probably be a random decision! I see , a double translation is horror for every novel , and I hope the ones translated from french are retranslated again from the original. By personal you mean that the story takes place in his hometown , right ? So you have read Chronicle in stone ?